A few years ago we had gorgeous end-grain wood floors installed in parts of our downtown Chicago store (see above). When the floors started to buckle recently, our heart sank. First of all, we love end-grain wood floors because they magically hide the inevitable marks of showroom life. Second, we love and appreciate wood so we couldn’t imagine disposing of over 5,0000-square-feet of it. Our end-grain wood flooring ready for resale at Rebuilding Exchange. Thankfully we didn’t have to. 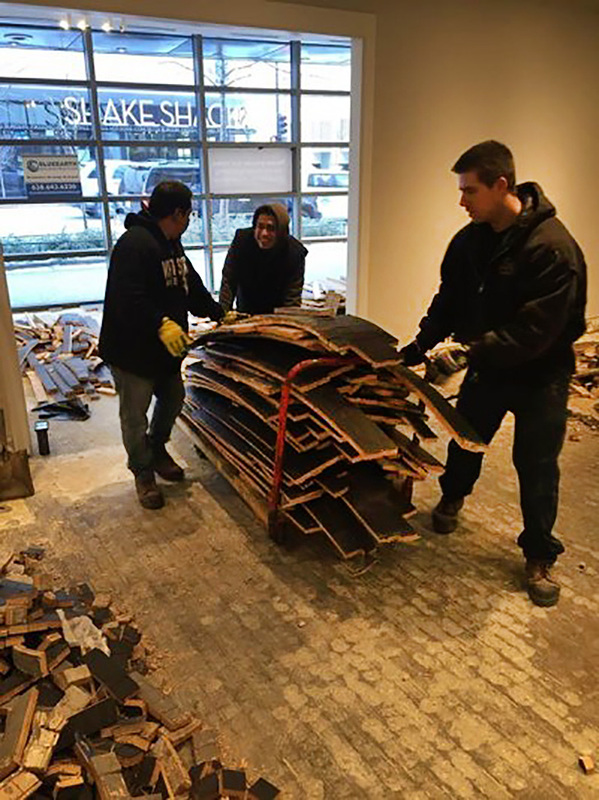 Our Chicago store team and Facilities Manager Mike Thorson decided to donate the flooring to Rebuilding Exchange. This eco-conscious nonprofit sells salvaged building materials and furniture made from reclaimed goods, and they provide job training for people with barriers to employment. It was easy to get on board (pun intended! ), and Rebuilding Exchange even connected us with the friendly guys at BlueEarth Deconstruction to have the floors removed and delivered to their warehouse. Workers from BlueEarth Deconstruction removed the flooring and delivered it to Rebuilding Exchange. 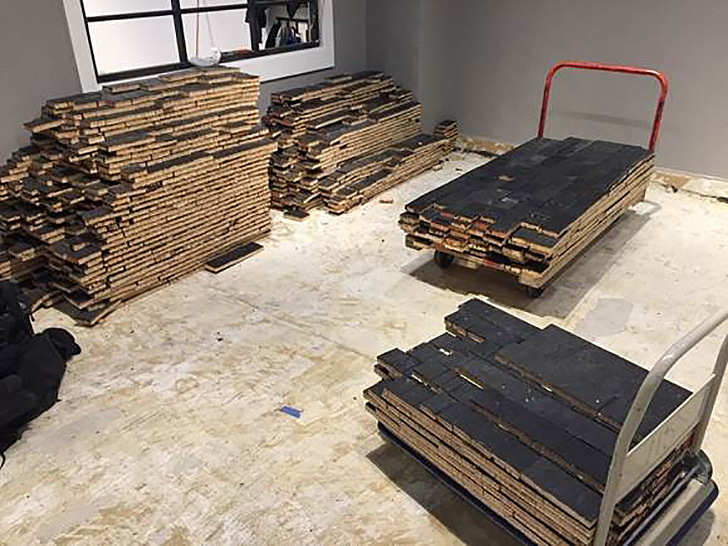 They salvaged over 70% of the end-grain wood flooring and Rebuilding Exchange sold it for $1.50 per square foot. Everybody won—Rebuilding Exchange got some lovely donated material and we turned a problem into something we could feel good about. And some savvy shopper got a great deal on floors. We donated over 3,500 square feet of end-grain wood flooring. 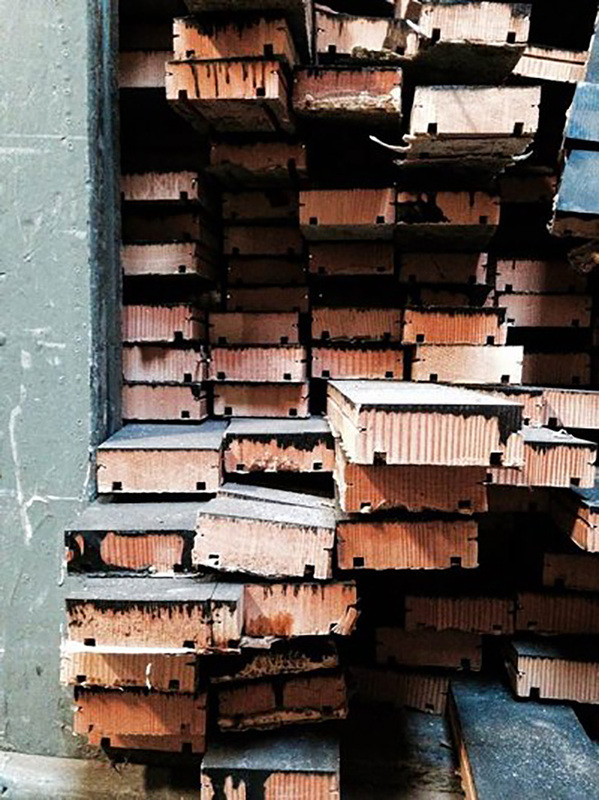 If you’re in the market for flooring or other reclaimed materials, be sure to check out Rebuilding Exchange’s Retail Warehouse or RX Made furniture and accessories. Into DIY? They teach classes, too. Think wood shop for grown-ups. Or watch this great video about the impact they’re making in their Chicago community.